DIAL: Tropical aged chocolate brown dial with black rotating inner bezel. Central disc with MEMOVOX and triangle for alarm indicator. 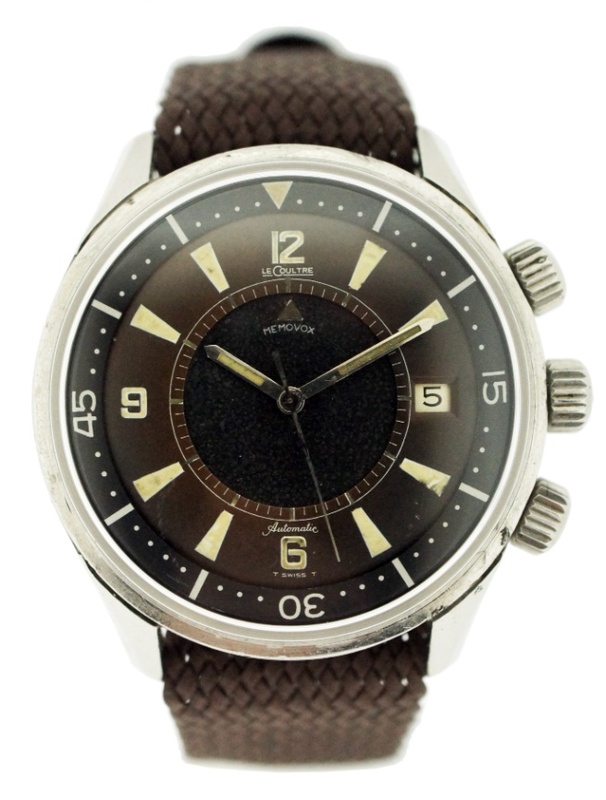 CONDITION REPORT: The Dial has evenly turned to a chocolate brown color from its original black, a so-called Tropical dial. The Inner alarm indicator disc shows signs of aging. The diver rotating ring is in perfect condition. The dial and hands are completely original with their original tiritum lume and are untouched, but show signs of aging. The case has some marks and scuffs from wear, most notably at the one o’clock position on the case. The case appears to never have been polished. The acrylic crystal is a later replacement, but an original crystal was kept with the watch. The movement was overhauled in 2015 and is working perfectly. Jaeger LeCoultre began testing under water alarm diving wristwatches in the 1960’s. To optimise the transmission of sound under water, this Polaris diver’s alarm watch has a patented triple back case. The Memovox Polaris remains a symbol of Jaeger LeCoultre mark left on the development of diving watches in the 1960’s. According to Jaeger LeCoultre, 1,714 of these Polaris watches were made, and they remain very collectible.